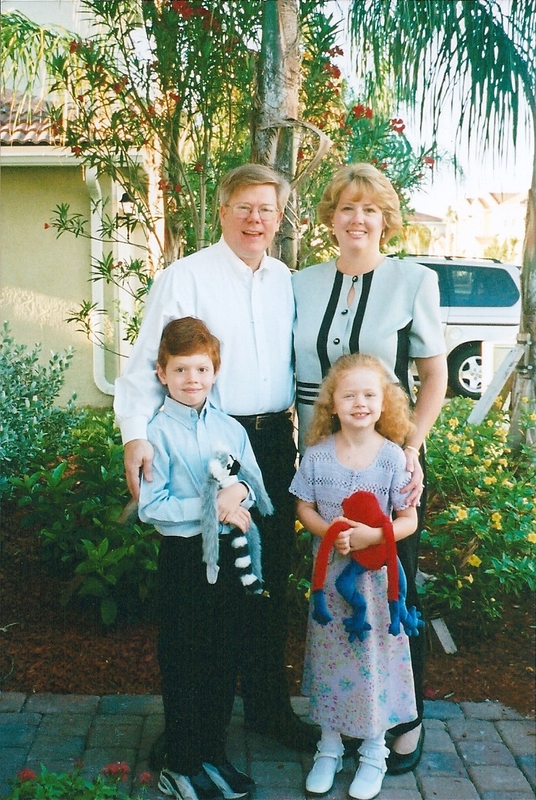 This photo marked our first Easter in south Florida. It truly was a new beginning for all of us. The year before was without a doubt the hardest year of our lives. I underwent surgery, Doug’s job was cut, we had to sell our home, and my father died. In January of 2003, Doug was offered a job in south Florida and we moved there in February. The sunshine and warm weather were a balm to our souls after what had felt like a never-ending winter. The day we left the northeast to make the long drive south, it was 4 degrees below zero. We had experienced several days in a row of snow and the grayness and cold seemed to have seeped into my heart. The Florida sunshine was so healing. For the first two weeks, I just literally sat by the pool and soaked it in. I also made the unfortunate decision to cut my hair short and have it dyed white-blond. My new stylist tried to talk me out of it, but I was determined to make a big change. In my mind, it represented a break with the previous awful year and a brand new start. The main thing I see when I look at this photo is a family who is bonded together in a very powerful way. Having lived through a year of heartbreak, we were more aware than ever of the preciousness and brevity of life. We were stronger, full of faith, and ready to seize all the joy and laughter we could. The church we visited that year had the strangest Easter service ever. It looked like a traditional Baptist church on the outside…but the minister rambled on and on for about an hour and a half…and he never mentioned the resurrection or the fact that it was Easter Sunday even once! However…even that weird service could not dim our joy. Easter is a glorious time of new beginnings and we were living ours. Because of Easter, Christ’s love and joy blaze undimmed regardless of circumstances. He is an expert at healing wounded hearts and giving beauty for ashes. I actually like that hair cut on you. That’s bizarre about that church’s Easter service. We moved back to NH in July 2007. In many ways, Florida was a challenge for us (I’ll tell you more later) but it is a beautiful place and we made some wonderful friends. It’s a great place to visit, but we would not want to live there again.